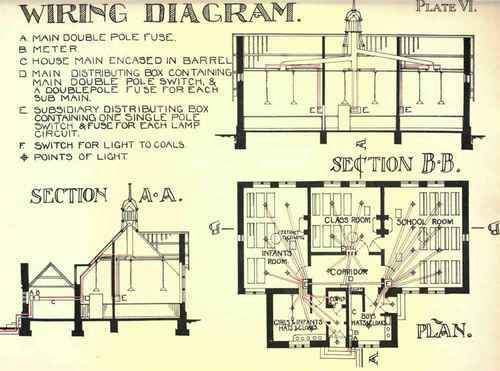 There are three general systems of arranging the conductors within a building for electric lighting purposes. 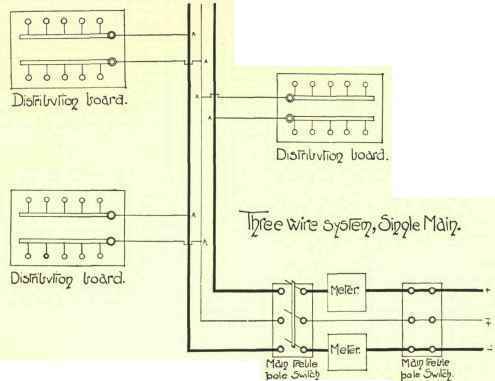 These are the Tree or Single Main System, the Subdivided Mam System, and the Three- Wire System. This system is diagrammatically illustrated in Fig. 139, from which it will be seen that the house mains, after passing through the main fuse, the main switch, and the meter, are taken straight through the house; and branches of the same size as the mains are taken from the mains at convenient places and connected to the main terminals of local distributing boards. This system should only be used in small buildings, as it is impossible to divide up the single mains for testing purposes, which makes it very difficult to localise a fault. The tree system is permissible when connected to a private generating plant, but it is usually prohibited by the regulations of a supply company. 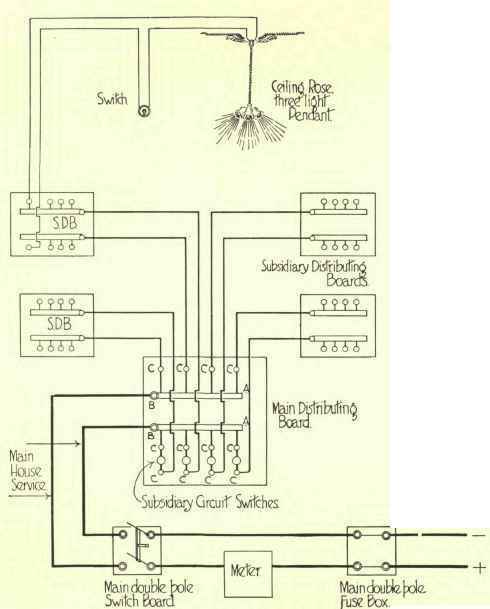 Distributing boards are not always used with the tree system, the minor branch wires being simply jointed or connected by means of small fuse boxes to the branches, as shown in the right-hand top corner of the diagram. In this system the mains, after leaving the meter, are carried to a main distributing board, from which separate smaller leads are taken to the local distributing boards, as shown diagrammatically in Fig. 140. The advantages of this system are that each separate circuit may be readily tested and isolated at will; each circuit can be provided with a separate cut-out; and each circuit can be arranged to carry a limited current. The Three-Wire System. - When the number of lamps to be lit reaches 100 or more it is often economical to employ the three-wire system. 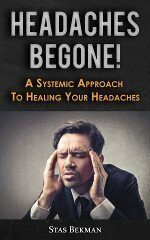 The advantages of this system may be explained by means of a few simple diagrams. Thus Fig. 141 represents two circuits of conductors and lamps supplied by two separate dynamos, each at, say, 100 volts pressure. If now the two dynamos be connected up in series the lamps may be fed by three cables instead of four, as shown in Fig. 142. If there be the same number of lamps on either side of the central or neutral wire, no current whatever flows through it. Where the three-wire system is used, therefore, it must be so arranged that the same number of lamps are likely to be switched on at the same time on either side of the central wire. As it is usually impossible to ensure this always occurring, there is usually a current flowing in the central wire, the amount of which is the balance of the amount flowing on the side with the most lamps switched on over the other side. The lamps can usually be arranged so that the current flowing in the central wire is never very great. For this reason the central wire is usually made smaller than the outside wires. The actual area depends upon the difference in the number of lamps which are likely to be switched on on either side of the central wire, but the central wire should rarely be less than one-third the sectional area of the outside wires. 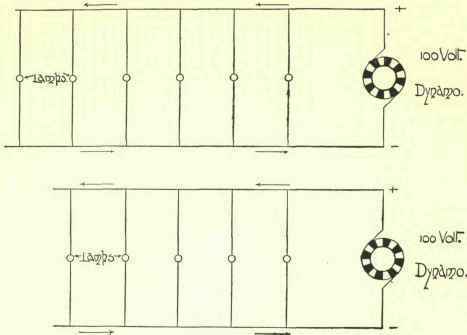 The three-wire system of wiring may be applied to a building on lines somewhat analogous to the two two-wire systems already illustrated. Thus Fig. 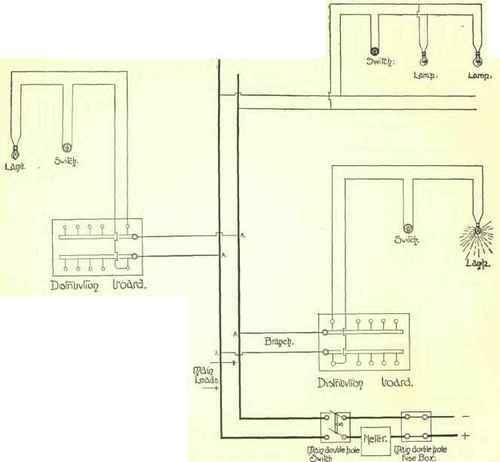 143 shows diagrammatically the application of the three-wire system upon the tree system, in which the mains are taken through the building, and branches are taken from them to local distributing boards. The objections to this are the same as explained in connection with the single main system. suitable system is illustrated in Fig. 146. 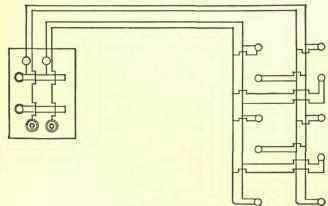 The advantage of this system lies in the saving of copper in the conductors, which in a well-arranged system amounts to nearly half; and also in the gain in pressure throughout the system, there being a difference of potential of 200 volts between the outer conductors, while the pressure across the lamps remains at 100 volts. It should be noted that with the three-wire system treble pole main switches and fuses should be used. In any wiring system it is advisable to place a cut-out at the junctions between thick and thin cables, so as to protect the latter against an excess of current, and care should be taken that the fuse is placed at the exact junction and not a little way along the thinner cable, as in Fig. 144, where it will be seen that, in the event of a short circuit across BD, or a leakage to earth from either AB or CD, those wires will fuse and perhaps cause a fire. Method of Connecting Lamps Incandescent lamps should always be connected up in parallel or multiple; that is to say, one wire connects one terminal of each lamp to one bus bar, and another wire connects the other terminal of each lamp to the other bus bar. Incandescent lamps are rarely connected up in series; that is to say, in such a manner as to have one circuit passing through a row of lamps, because the breakage of the filament of one lamp would cause the whole row to go out. There are two distinct ways of connecting lamps up in parallel across the bus bars of a distributing board. 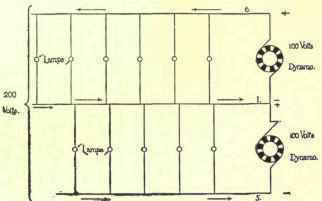 In one each lamp has a separate pair of conductors, as at A and B, Fig. 145, or each group of lamps has a separate pair of conductors, as at C. In the other method a single or common wire connects one terminal of each lamp to one bus bar, while separate wires connect the other lamp terminals to the other bus bar, as shown in Fig. 147. These separate wires are called the "switch" wires, as they are connected to the switches so that each lamp may be switched on separately. When a room is lit by a number of lamps arranged in rows, and it is convenient to arrange the lights so that they may be switched on in groups, the lights are frequently wired as shown in Fig. 148, where it will be seen that alternate lamps in each row are controlled by one switch, so that should one fuse "blow" the room is not thrown in complete darkness, and the lamps left burning are well distributed. Wherever possible it is advisable not to make joints in cables, and joints can usually be avoided by a method known to the trade as Looping out. On referring to Figs. 139 and 143 it will be seen that a joint is shown at the points A, A, A. These joints may be avoided by taking up loops in the main cables and connecting the ends of the loops to the terminals of distribution or fuse boards, as shown in Fig. 149. All fittings, such as lamp holders, ceiling roses, fuse boxes, etc., are made with large terminals to permit this system of looping out to be applied to them. In the lower portion of Fig. 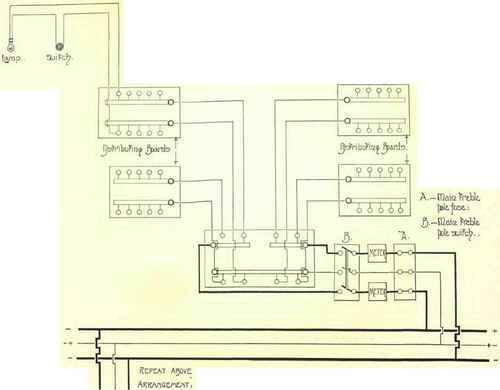 150 a number of lamps are shown connected to a pair of leads by jointed branches on to them as at A, A, while the upper diagram shows the method of avoiding joints by the system of looping out.